I remember watching this on the telly back in 1994, and not really thinking it was "THE" last episode, as George Cole had said in interviews that MINDER would continue as the odd Christmas special. I did laugh at the thought of the fish going bad in the boot of Arthur's jag, plus poor old Dave getting arrested at the end of the episode too! Indeed this was a very sad day for TV as a whole. Minder for me was pretty much the last cool show on TV and there have been very few shows since that have had any sort of impact on me. The arrival of multi channel television since the end of Minder quality programming has gone down drastically to where we are today with reality TV. What is particularly sad is that series 10 was, bar the obvious episode very good and there are some episodes in particular I really like such as 'Another Case of Van Blank','On The Autofront', 'All Quiet On The West End Front' and 'One Flew Over The Parents Nest'. This last one is always sad to watch as it really is the end and those final scenes remind me very much of watching it the first time on original transmission - sad then and sad now, albeit then I had no one to share this with - unlike now in a place where my fellow fans understand. That has to be a good thing! The horrendous 'Italian' accents here are quite something! A very weak Minder episode as most of the plot centered around Crankie Frankie and Luigi and their two wives. Arthur was still in a lot of scenes, but Ray not so much. The last episode should have featured the two more prominently in the story. If you listen to the commentary with writer Tony Hoare, he said he wrote it thinking it was just another Minder episode and didn't know it was planned as the last. The audio commentary was probably a 75/25 split with Hoare doing 75% of the talking. Should have been more conversing with Arthur, but he took a while to answer questions, so maybe he wasn't feeling to well at the time? The plot just kept going back and forth way too many times from Frankie believing Arthur about his wife's infidelity to not believing him. One of the few episodes where I was more annoyed than entertained. Arthur did have some great final lines when he was being hauled away after being nicked, but rather a closing line about the series, his last line of dialogue in the show was only about Luigi. Definitely not the ideal way to go out. Arguably, the worst of series 10 and a very sad note as it was the last. I wouldn't say it was the worst but it certainly isn't the best one. The commentaries were always on and off with GC I thought. Undoubtedly nice to hear, but he seemed very quiet a lot of the time and would often tell us similar anecdotes he remembered. Although these were always nice to hear of course, it was very similar to things he'd said in interviews ten years or so previous which I'd seen before so 'new' info was limited from him in particular. Granted, he was getting on when these were recorded and Minder was many years previous but I wonder if NOT always having GC on but instead choosing another semi-regular might have rendered some different anecdotes or memories of the show. The 'A Taste Of Money' commentary was particularly painful to listen to and George, as much as you love him, can have hardly have been less forthcoming and in that. Having Nick Day, Jonty Stephens or Glynn Edwards on might have been an interesting twist on the stories. Nevertheless, the commentaries are a really great addition to the DVD sets and a highly recommended listen! Yes, it was still a good listen with Tony Hoare, but I pictured George just snoozing while the moderator and Tony talked, and when they called on George to answer, he had to perk up and think of something to say. It may have been best to have him only do half of it, and another actor, as you mention, be around to chat during the rest of the episode. Yep, la Costa nostra restaurant! Cranky frankie! Watched late last night and again I remember watching this when it first aired in 94 and my first viewing since. I didn't mind this one, not the strongest, but decent enough. An appearance by the late great John Bardon is always welcome. My biggest gripe in this episode was the Italian accent by Carla, the wife of Luigi, it truly was shocking. It made the Policeman in 'Allo Allo' look genuine. The guy who played Crankie Frankie was guilty of over acting as well in my opinion. Just a little sad that it ended at this point and everyone having a go at Arthur in the back of the police van. Crankie Frankie played streaky in the brilliant film McVicar. As the last episode of Minder I think this is an extremely weak episode. Arthur and Ray seem like guest characters in their own show during the second half. I enjoyed Arthur's crazy ideas for the Italian restaurant and his cluelessness that it could be offense or in bad taste. Sadly I found most of the episode disappointing. Minder the show, the characters and actors deserved to go out on a high note. What did people think of this in 1994 when it first aired? Good question ... I think the final scenes were quite nostalgic at the time, some mentioned parallels with Terry being locked up 'Gunfight at the OK Laundrette'. I think at the time it was all about the ending of the episode for Arthur, the events leading up to that being somewhat insignificant to most. He probably deserved a bigger and better send off than this and although this was ok, the show deserved better. I think you are right about 'guests in their own show', certainly Ray has a bit of a nothing part in this very last one. I am just glad Minder didn't go down the Only Fools & Horses route which descended into complete nonsense. 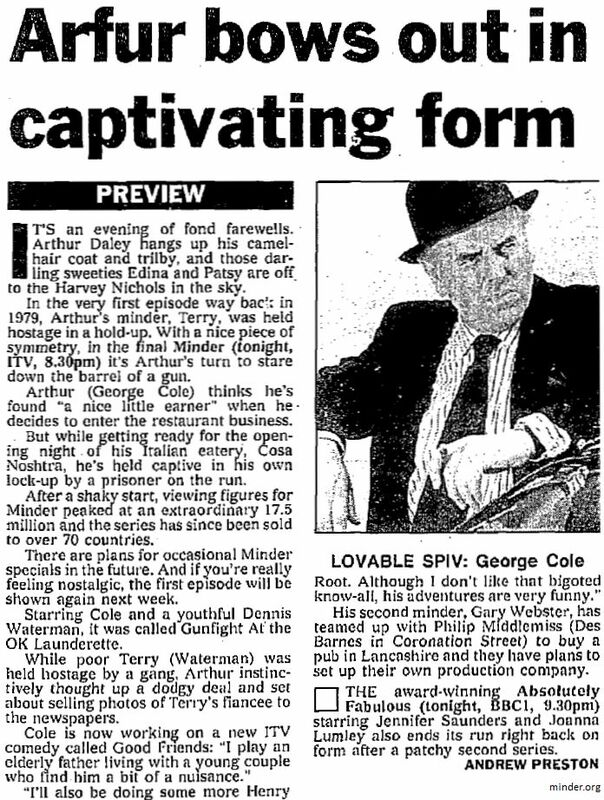 This wasn't entirely the end of the 'Minder' name though, George Cole did some TV ads in Australia as Arthur with a female assistant called Terri, sadly none of which have ever surfaced and 2009 was of course yet to come. Hands up if you always wished Arthur could return with Ray even after this? I did. Minder definetly had some life left in it. I think by this point Ray had come into his own as a character and wasn't just the replacement for Terry any more. I enjoyed most of series 10, for me 'All Quiet On The West End Front' was probably the highlight of the series. I really wish we had got those 3 specials that were originally planned. I thought it would come back as one off specials, as was announced at the time and was sad when I watched the final episode. I don't think the team behind Minder would have wanted to sign off with that episode. I just saw it for the first time yesterday and I'm in the US so I have no idea what was said or announced about the series in 1994. This episode did give me the impression that NO ONE involved in its production thought this would be the last time Arthur and Ray would be seen. It is a shame there wasn't at least a follow up special to give Minder the send off it deserved. Pr1, will you be watching the 2009 remake? Yes I will. I'm going to wait awhile before I watch it. I don't want fresh memories of the original to cloud my opinion of the "new version". I was finally able to start watching Minder on DVD about this time last year. I watched it fairly steady with occasional breaks between series. I may wait a couple of months before starting the 2009 series. I'm also fighting the urge to start watching Minder again from the beginning. I enjoyed it that much and it was well worth all the years I waited to see it. The issue as soon as 2009 Minder comes along is that it turns into massive debate about should it or shouldn't it have been made - the majority often siding with the latter. In order to avoid that, I say let's keep chat on this thread about this series 10 episode only and the end of Minder, resisting the urge to go on to debate the 2009 series - which should ideally be done on a different thread (and has been if you have a look). One thing about this episode I have wondered, how 'authentic' a tough pyscho is Crankie Frankie compared to other nutters in the series? Hard to say. Tony Hoare said that he based the character on Mad Frankie Fraser but I think that had more to do with the name rather than his personality. I think that's fair. His bark is probably louder than his bite. I have a slightly different take on this one...the prolonged ending scene with the aerial shot of Arthur being carted off in the Police wagon did seem to me to signify it was the end...very unlike any other ending(?) My over-riding memory of this ep is GC still acting the others off the screen..even in the rather ludicrous way it ended in the Winch, he was Arthur to the very end. Tony Hoare said that he didn't write it as a final episode but I reckon that Euston knew that it was the last one (I'm pretty sure that it was announced that the series was coming to an end whilst they were filming the 100th episode). Maybe the ending of the episode was altered at some point?